Easy, crunchy, and juicy chicken drumsticks that are bursting with flavor straight from the air fryer. If you’ve never had air fried chicken, it might sound a bit funny – because food in an air fryer isn’t fried – it is more like ultra-convection broiled – meaning you can use just a tiny bit of oil and still get delicious crispy chicken. Air fryers are awesomely easy to clean (some even pop into the dishwasher) – and so simple to use. 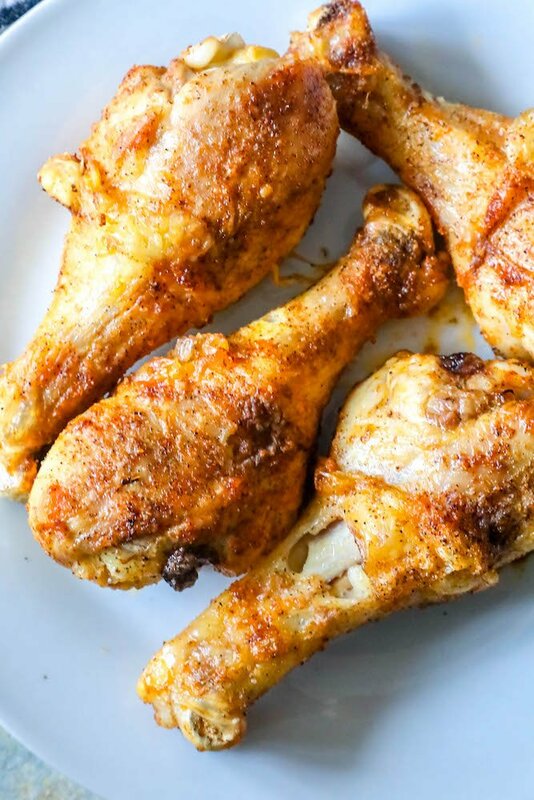 Simply add chicken to marinade, shake, place in basket, and cook – and you’re on your way to a delicious, perfectly juicy chicken drumsticks with crispy skin! This delicious recipe for the best air fried chicken ever will quickly become one of your very favorite dishes to make – I hope you love it as much as we do! 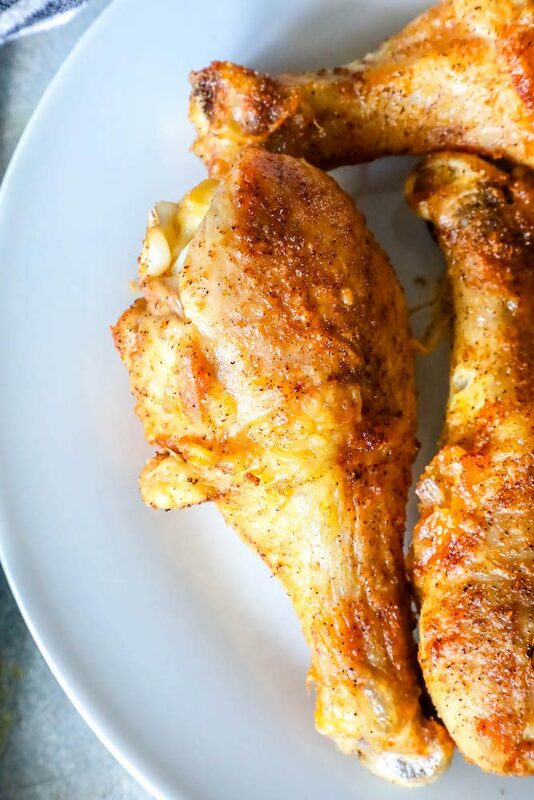 This Air Fryer Chicken Drumsticks Recipe is gluten free, dairy free, and keto diet compliant -as well as heart healthy with a little olive oil for a versatile chicken recipe that works in anyone’s healthy eating plans. Just Take Me To The Best Air Fried Chicken Drumsticks Already! 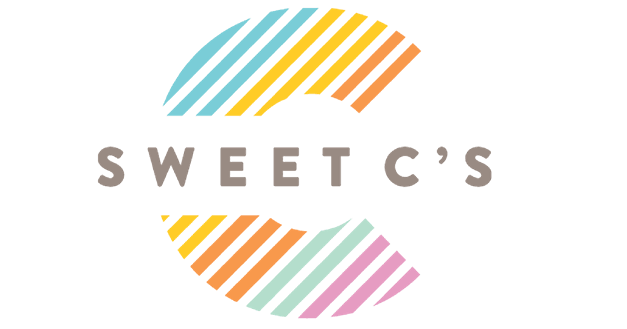 I get lots of comments and questions on my posts and recipes, so I try to provide as much information as possible for my readers. If you’d rather skip over that, please scroll to the bottom of the page where you will find the recipe. 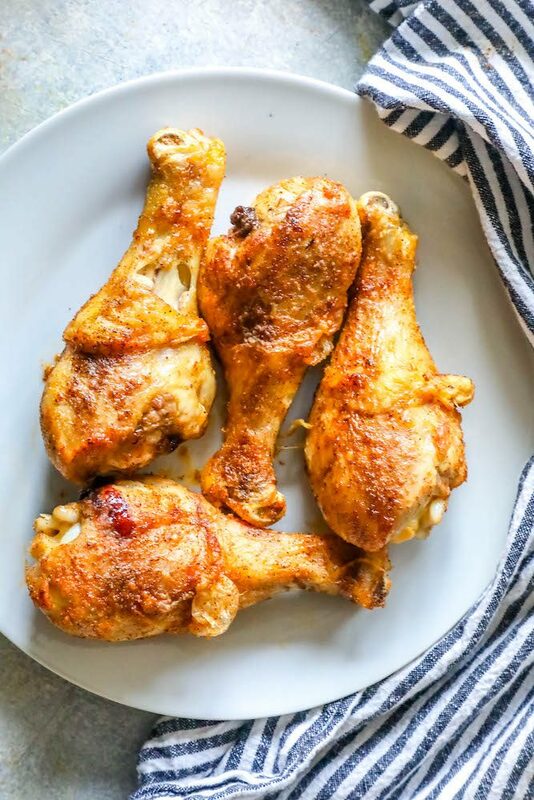 This air fryer chicken legs recipe gets deliciously crisp, crunchy chicken drumsticks with crunchy chicken skin without deep frying. The only oil we’re using in this recipe is just a little bit to get the crispy, crunchy chicken skin – about two tablespoons of oil that you’ll use on all the chicken legs just to give them a little glisten. You’ll be using just enough oil to coat the drumsticks, not enough to actually fry them. Since traditional fried chicken is cooked in hot oil, it can be coated. This air fried chicken is naturally keto diet compatible and low carb as we’re not breading it at all – merely coating in a little oil and adding straight into the air fryer basket! This recipe goes from the fridge to the table in less than 30 minutes – and will soon become your favorite gluten free way to cook chicken drumsticks and even chicken wings! Run your air fryer for a few minutes before adding the food so it is hot and ready to go when you go to air fry your chicken drumsticks. -Toss in hot sauce at the end. If you’re going to sauce your drumsticks, wait until they have cooked and crisped to toss in sauce. Since air fryers are completely sealed off, it’s hard to judge your chicken’s doneness by the look of it. Don’t open your air fryer constantly, letting heat escape – trust in the timing of the recipe. When your timer is done, immediately test the temperature of the chicken pieces with a digital thermometer inserted into the middle of the thickest part of the chicken drumstick without touching bone. Chicken should be 165 degrees internally. If chicken has not met 165 degrees internally, add another 2-5 minutes to cooktime. Air fryers help get hot air to circulate around the chicken drumstick to get a heat so high it makes meat seem fried – and to do that, it helps to not crowd the pan. Put the chicken in your air fryer pan in a way they aren’t crowding each other – it makes a huge difference. If you love this delicious air fried chicken drumsticks recipe as much as I do, please give it a five star review and help me share on fb and pinterest! In a small bowl, combine herbs and spices. Set aside. Place chicken in a bowl or a plastic bag and drizzle with olive oil. Toss to coat. Sprinkle herbs and spices all over chicken drumsticks to coat them. Preheat air fryer at 400 for 2-10 minutes. 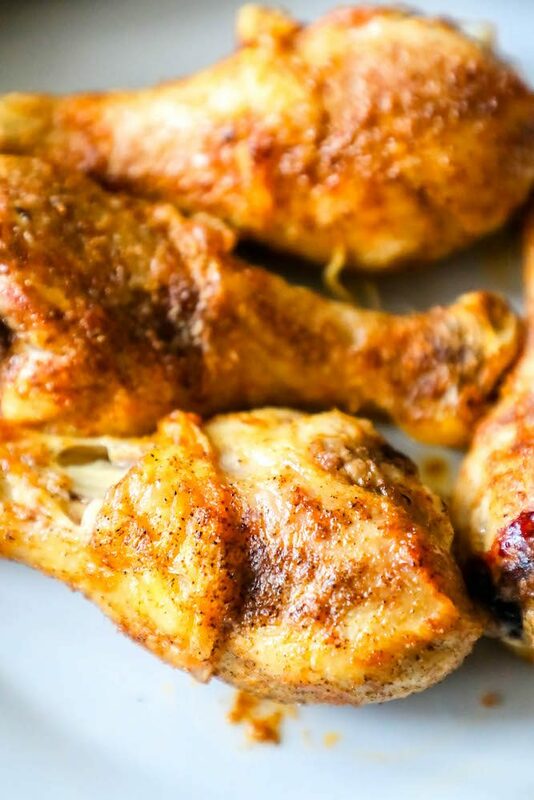 Place chicken drumsticks in air fryer basket and cook for 10 minutes on 400. Remove basket and flip chicken drumsticks. Cook at 400 for another 10 minutes. If chicken is not 165 degrees internally, add another 5 minutes of cook-time. Time can vary based on drumstick size, so do check the temperature after cooking to prevent over or under cooking. When chicken has reached 165 degrees internally, serve immediately. SO crispy and delicious! YUM! Love the way these drumsticks turn out! I bet these are so juicy and have a nice crispy outside. Yum! These turned out so crispy on the outside yet so juicy on the inside. My family loved these! 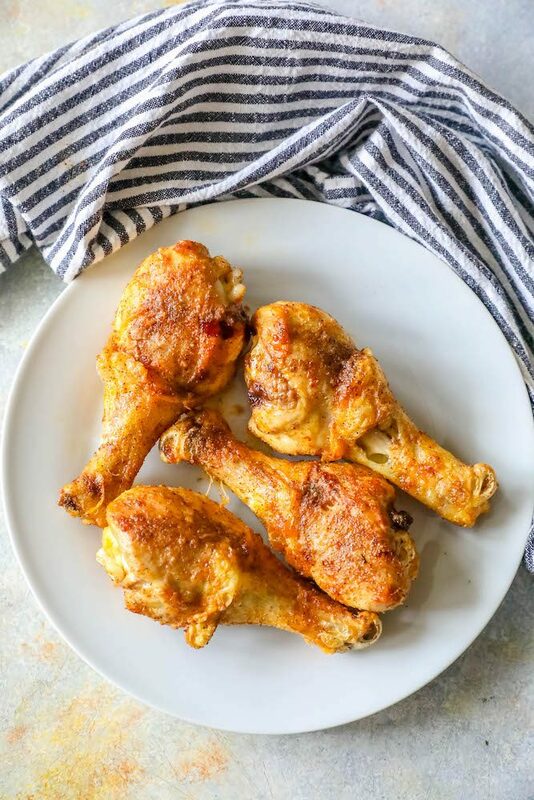 These drumsticks were so easy to make in the air fryer and everyone at our game night loved them! Please remove me from you notifications. Since it is an opt-in on your computer I can’t actually turn it off.